Some are people of few words, while others can’t seem to stop talking, but what about the ones who don’t speak at all? All Michelle Rubin ever wanted was for her autistic son to speak. So when all hope seems lost, Michelle tries something new: animal therapy. In Chicken Soup for the Soul: Raising Kids on the Spectrum, find out what happens when Michelle brings her son to therapeutic horseback riding. I wanted my son to talk to me. I wanted him to express himself in the ways that my other children always could. Scott is the oldest of our three boys. Watching how easily life moved along for our other two sons made Scott’s struggles seem even more difficult. We were exhausting every resource we could to bring our autistic son into our world. I had an overwhelming desire to hear his voice, and I decided to try animal therapy, specifically horses. I enrolled Scott, at age four, in a therapeutic horseback-riding program in Broward County called Horses and the Handicapped of South Florida, Inc. I am by no means a “horse girl,” but I had heard about their uncanny intuition with special needs children. I had been told that riding a horse could help individuals with autism conquer their sensory defenses and increase communication skills and cognitive reasoning. I wanted Scott to achieve all of these things, but most of all I wanted him to experience some sense of normalcy. I thought that if these horseback-riding lessons could bring him that feeling of accomplishment and belonging, then I would be sold! Scott’s first time on the horse gave me a view of my son I had never experienced before; he was sitting quietly. 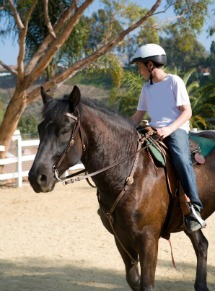 Scott’s first time on the horse gave me a view of my son I had never experienced before; he was sitting quietly. This gave me a glimmer of hope that he was indeed able to focus, to listen to direction, to experience something outside of himself. The horse seemed to accomplish all this and more. Scott is a natural sportsman. He has always enjoyed anything that gets him moving -- skiing, basketball, running. You name it, Scott will try it. Horseback riding would simply be another experience to add to Scott’s long athletic résumé. Over the years, I watched the instructors and volunteers work patiently with Scott, encouraging him, reminding him of the riding cues. The instructor gave him basic direction: pick up your reins; steer to the left; steer to the right; say “whoa” to tell your horse to stop; say “walk on” to tell your horse to go. Suddenly, after nearly fourteen years of life, Scott spoke his first words, and they were on a horse! He told the horse to “walk on.” This sudden onset of speech came as a complete shock to our family and everyone who knew Scott, including his medical team. His time on the horse suddenly took on a new meaning. He had made the connection that when the command “walk on” was given, his horse would move. There was my formerly silent son, on top of a 900-pound animal, speaking clearly and confidently, as if he had been doing it his entire life. Soon this connection spread to other activities and Scott quickly joined the social circle of our family, his school and the community. Scott has been riding for sixteen years now, and I have seen tremendous improvements in not only his speech, but also in his confidence. He began riding with a horse handler and sidewalkers, helping him find his balance. Today, Scott is one of the ten fully independent riders. Not only does Scott say “walk on,” he is able to use all of the proper verbal commands to direct his horse fearlessly at the walk, trot and canter! He is the official “barn greeter,” asking volunteers and staff alike the most important question: “What did you have for lunch today?” Hearing Scott talk is music to my ears, as he confidently relates to his peers. When people forget what they have had for lunch, Scott keeps them on their toes. Scott will pry it out, and no matter what you have had to eat, Scott’s lunch was always better than yours! Scott has given me, his dad, and two brothers a life we would never have known -- one filled with empathy, patience and caring. Scott and his classmate Stephanie partner up each week to canter around the arena, something that would scare most people. It is an absolute thrill for Scott. He has ridden in the Broward County Special Olympics Games and is always called upon to help at special events for Horses and the Handicapped, where he delivers a short toast to the crowd with ease, and mingles with guests like it is his job! Scott has given me, his dad, and two brothers a life we would never have known -- one filled with empathy, patience and caring. I know it goes against the grain to say that in many ways we are grateful for Scott’s autism. I often remark to families dealing with the grief of initial diagnosis that “it’s not as bad as you think” and I really mean it. It took 10 years on a horse for Scott to finally speak, but the transformation was miraculous. Michelle watched her son go from a silent boy to the confident young man that he is today. For more inspirational stories like this one, pick up a copy of Chicken Soup for the Soul: Raising Kids on the Spectrum! And for other titles, visit www.chickensoup.com.